Racks on racks. It’s what Thule’s known for. But over the past few years, the Swedish rack crafters have carefully and thoughtfully been expanding to other realms making sure that their sleek styling and practical functionality translate into every new item: cargo carriers, jogging strollers, luggage, backpacking packs, phone and laptop cases, camera gear—you name it. Active Junky has been testing a trio of Thule products on the trip of a lifetime, day-in and day-out. Starting stateside in Colorado, Utah, and California, our tester then hopped on a plane to Israel, then Thailand, and finally Indonesia. Read on for full reviews of Thule’s new travel gear, and get a better sense of what they’re delivering to the market in 2017. And don’t forget to sign up for Active Junky for exclusive deals and cashback on your gear purchases. If you’re looking for a simple, straightforward, and lightweight backpack, this ain’t it… However, if you’re obsessed with organization and love to have every piece of gear neatly slotted in its own corresponding compartment, then the feature-rich Thule Guidepost 65-Liter is your new favorite travel buddy. 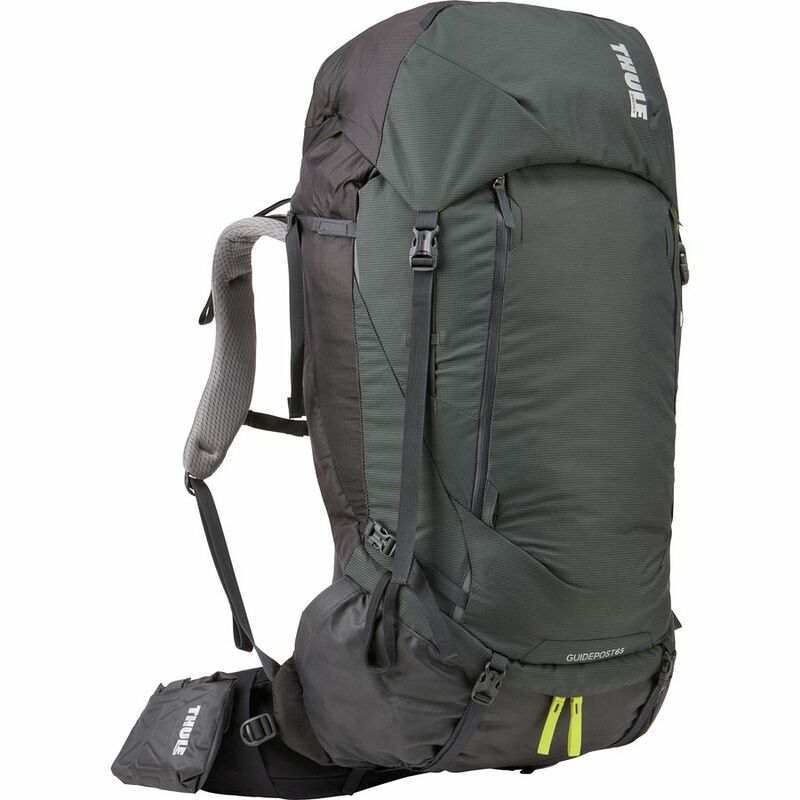 Pros: The Thule Guidepost 65-Liter offers features on features including: outer compartment accessible via both a zipper and a flap; detachable brain unclips and converts to a lightweight 28L pack; outer “J” zipper swoops around the bulk of the pack, so accessing the depths of the bag is never difficult; and Thule’s well-thought-out hipbelt VersaClick system, which included a removable roll-top stash bag, and offers additional accessory options like DSLR holster (which we didn’t test but looks rad in the theory. Cons: Clearly features are in abundance here, and as such, the weight of the pack is on the higher side. 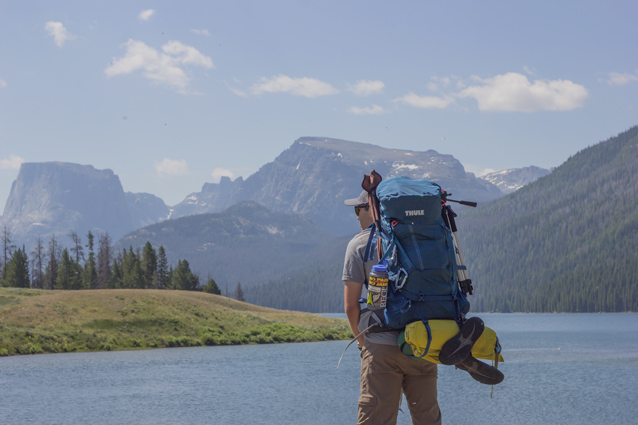 Comfortable, adjustable shoulder straps, ample back padding, and extra organizational features are, for some gram-counting backpackers, going to nix this luxurious pack from consideration. Our tester found the pivoting hip belt unnecessary and the results negligible. That said, the pack is still comfortable, but you’re paying a premium price partially because of this hip belt. Our tester’s hips don’t lie—if you’re expecting a magical solution to your hip pain, you may be disappointed. Bottom Line: A cushy, luxurious, feature-rich gear hauler for the organizationally obsessed. Our Thule Aspect DSLR/ILC Shoulder Bag has taken a beating. It’s been tossed around during a road trip through Colorado, Utah, and California, banged and bumped on hikes in the Sierras, and exposed to cringeworthy amounts of sand in Indonesia. It’s been rained on and spilled on. Yet, the DSLR and extra lens within have remained in tip-top shape. Our tester packed the Canon 70D, and by removing one of the two internal velcro walls was able to pack a body and two lenses snuggly inside the cushioned Thule Aspect. Pros: Durability has proved itself time and time again, but it’s the pack’s features that solidify the Aspect as a winner. The outer pocket can easily fit a spare battery and charger, while the top pocket has organizational mesh pockets for SD cards, cables, a spare harddrive, etc. The over-the-shoulder sling style pairs well with a top handle, and the pack shines when on the move. 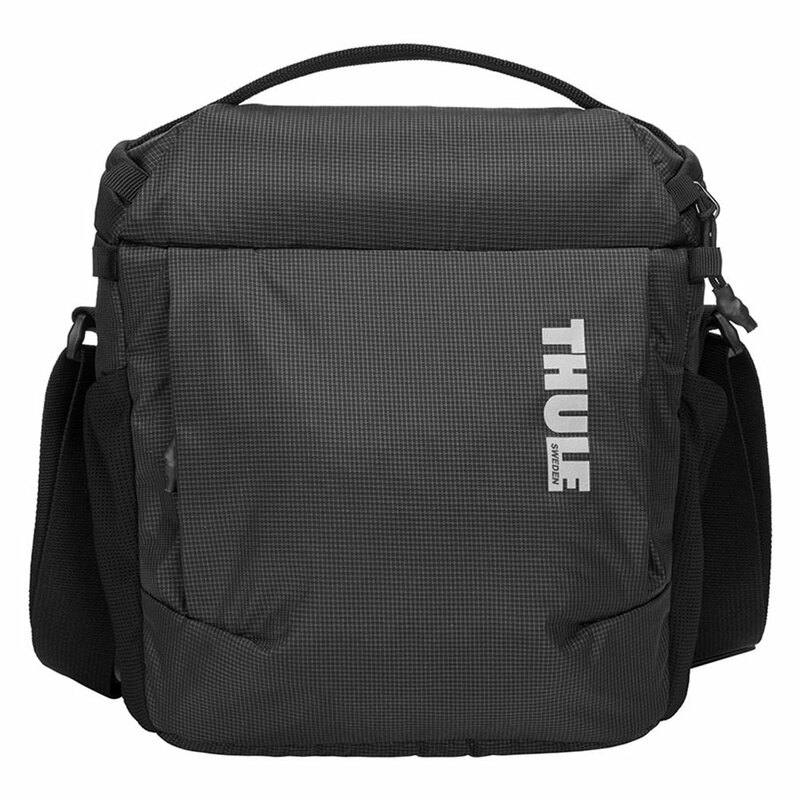 Cons: The camera bag isn’t designed for a big or even mid-body camera—internal sizing is the only qualm some photographers will have, but of course, you can look to some of Thule’s larger camera packs. Every international trip has its ups and downs. Mishaps are inevitable, mistakes bound to happen. 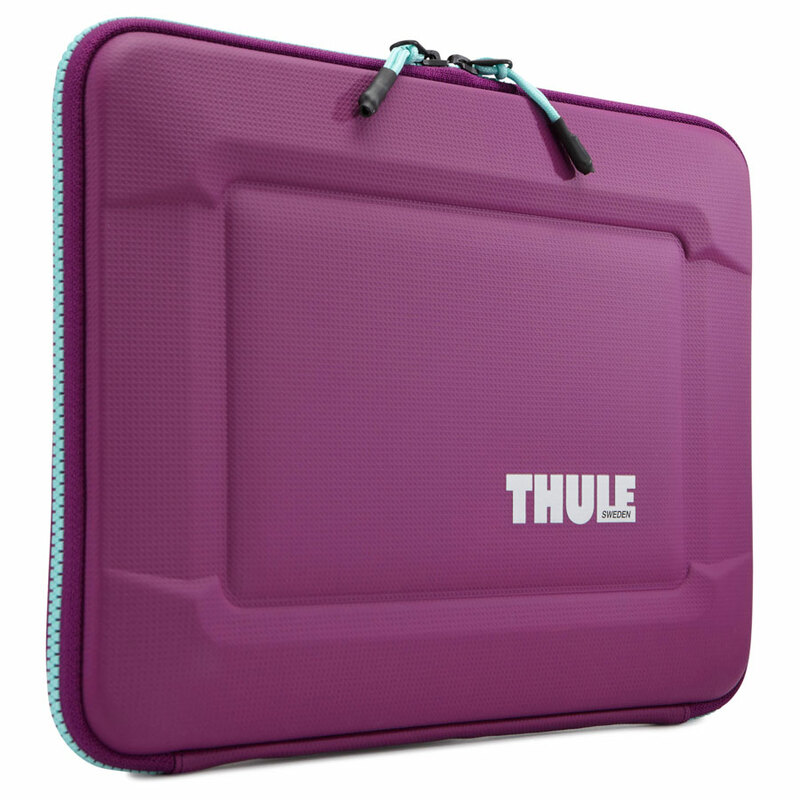 After one of our tester’s first nights in Indonesia, he woke up to find a small puddle of water on the surface of the Thule Gauntlet 3.0 MacBook Sleeve. Luckily, the Polyurethane exterior kept his MacBook perfectly dry. For a digital nomad, a traveler who can’t leave their laptop at home, or even a city slicker commuting by bike, the third rendition of the Thule Gauntlet is a smart choice, and it is available for a variety of MacBooks and screen sizes.